The BenQ SW271 is a monitor specifically targeted at photographers. It offers a number of features which are likely to be appreciated by enthusiast and professional photographers and videographers, while also being possible to use an all-round monitor for those who have more generic needs. Also a feature of this monitor is HDR-10, meaning that you can view your shots and videos in a wider dynamic range than a typical monitor. The BenQ SW271 retails for around £1,067 at the time of writing, making it one of the most expensive monitors currently available to buy. Using the SW271 straight out of the box is a very straightforward process. It’s simply a case of plugging the mains cable into the back of the monitor and into the wall socket and running the HDMI cable from the back of the monitor to your computer and you’re away. In the box, there are other types of cable included, including USB-C and Display Port, so you should be able to find a cable to match whatever you’re trying to input into the screen. In the box there is also a detachable shading hood. 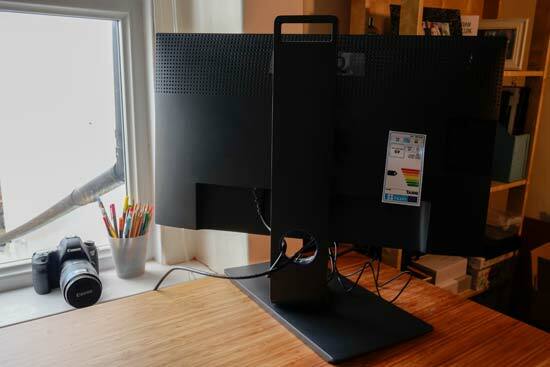 It’s worth attaching this if you intend to use the monitor near or opposite a window, but otherwise you may to choose to leave them off if you prefer - it certainly looks sleeker without these attached. The screen itself has a very sleek and slim appearance, the bezel around the edge is just couple of millimetres, allowing the display to take up almost the entire of the screen. The display area measures 608.8 x 355.3mm. The screen also not particularly thick (or deep) - overall you have a very large screen which doesn’t take up as much space on your desk or work top as you might think it would. Attaching the screen to the base plate on which you can position the monitor is also very easy - you simply slot it into place. This should take only a couple of minutes to do, and you won’t need any tools or equipment to do it - which is always a bonus. From here, you’ll be able to move the screen up and down to suit your preferred height, tilt it forwards and backwards, and rotate it - to a full 180 degree orientation if you like. This can be useful when viewing images in portrait format and you want to take advantage of the whole screen. The screen has a viewing angle of 178 degrees. A wide viewing angle like this means you should be able to see it well from a variety of different angles, displaying the same level of brightness no matter which angle you look at it from. There are a few physical buttons on the front of the screen, including the most prominent which can be used to switch the screen on and off. The other buttons are used to change the various settings offered by the SW271. You can press any of the buttons to bring up the on-screen menu, with each button then corresponding with the icon you see just above it. From left to right, there’s the input button, from which you can change the source of the screen - which is useful if you have two inputs, such as a computer and a tablet. The second icon is “Color Mode”, here you have the option to choose between various presets, including Adobe RGB, sRGB, B+W, DCI-P3, HDR, custom and calibration settings. To choose between the different options, the buttons transform into directional keys and confirmation keys - simply scroll to the choice you want to use, and press one of the other buttons to make the selection. 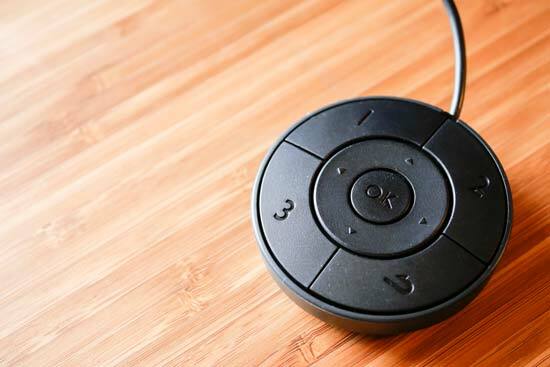 The fourth button corresponds to a brightness adjuster, while the fifth button allows you to go deeper into more advanced settings, such as Colour Adjustment and System settings. It’s worth spending a bit of time to get to know all the options available throughout the menu when you first set up the screen so you know where everything is. At the back of the monitor, you’ll find that there are USB slots, as well as an SD card slot. Due to the size of the screen these are a little awkward to reach - but it’s a good option for keeping a spare phone charger plugged in, for example. You could also swivel the screen quite easily to make it easier to reach the slots. Or you could leave a memory card permanently inside the screen with your favourite photos on board. It seems unlikely that you’ll use the memory card slot all that often if using the monitor with a computer which has its own memory card slot, but it’s useful to have it available none-the-less. In the box you’ll also find a “Hotkey Puck”, which, as the name suggests, is shaped like a hockey puck. You can use this to control the various settings of the screen, as previously mentioned as being controlled by the buttons on the screen itself. There are also three buttons which allow you to quickly switch between different preset modes - which is very handy if you often finding yourself wanting to switch between different preset modes (professional photographers are likely to find this feature particularly useful). The monitor is factory calibrated, meaning you can use it directly out of the box if you wish to. There’s a calibration report included which you can refer to if you have particular setup needs. It’s also possible to download “Palette Master” software so you can calibrate the screen to your own particular settings, using it in conjunction with a colorimeter (which you would need to purchase separately). Directly out of the box, the SW271 offers a very impressive display. It’s lovely and bright, and the detail it is capable of displaying is very fine indeed - it’s fantastic for looking at your images in fine detail, as well as displaying them at a normal size for an overall very impressive result. Being a 4K screen means that you can also use to view 4K video, as well as high resolution detail in your photos. This would make it an ideal screen for somebody who is both a videographer and a photographer. The screen has a refresh rate of 60Hz, making it slightly lower than some even more expensive models on the market, but, particularly for photographers, this shouldn’t be too much of an issue. This a screen which has very obviously been designed with photographers in mind. Images really pop, and the amount of preset options is ideal for those working with different colour spaces. Furthermore, the accuracy is superb. The calibration options are also perfect for those who intend to print out their images and want to make sure they get accurate colour rendition. 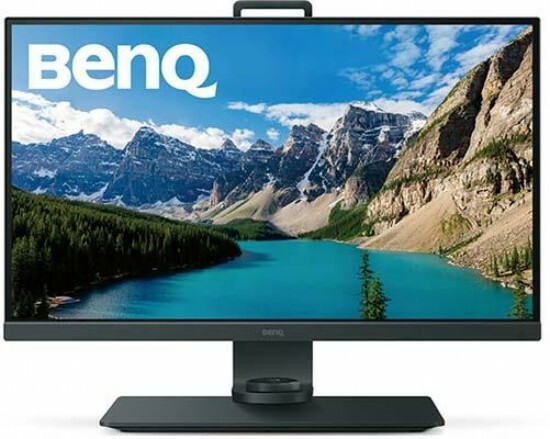 The BenQ SW271 is relatively expensive, as far as monitors go, but if you’re a photographer or videographer who is looking for a large-screen with superb image quality, then it would make for a great investment. Photographers in particular should enjoy the fantastic colour accuracy and high level of detail that the monitor provides. 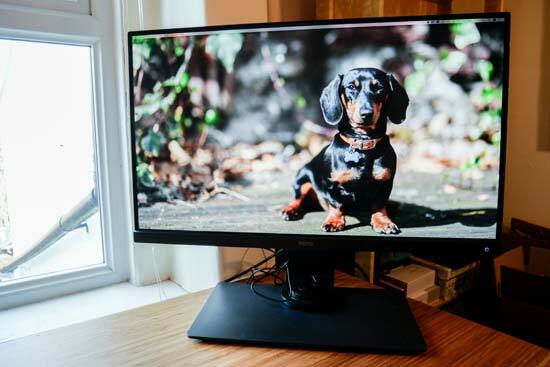 You may not think you need a 27-inch monitor, but once you’ve started to use one of this size, it’s hard to imagine going back to a much smaller screen - it makes looking at your images in fine detail very easy and impressive - macro photographers in particular may enjoy the fine detail afforded by the screen. Being able to switch the screen around to all sorts of different viewing angles makes it great for flexibility in your office, to position it away from direct sunlight, or to look at your portrait format images in a better way. The optional shading hood is ideal for those who need to protect the screen from glare, but unless your monitor is likely to pointing directly at a window (or sitting directly under a bright light), you might find that you don’t need them at all. The frameless sort of design is very modern and attractive, and also enables a large screen in a smaller space than you might expect - perfect for those with limited desk space to contend with. A good amount of connectivity options, and the handy “hotkey puck” round out the features of this great monitor.